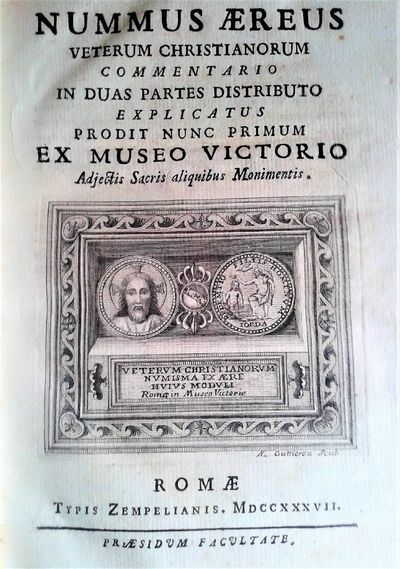 Nummus Aereus Veterum Christianorum Commentario In Duas Partes Distributo Explicatus Prodit Nunc Primum Ex Museo Victorio Adjectis Sacris aliquibus Monimentis. signed first edition Original full vellum binding. Vettori, Francesco. Nummus Aereus Veterum Christianorum Commentario In Duas Partes Distributo Explicatus Prodit Nunc Primum Ex Museo Victorio Adjectis Sacris aliquibus Monimentis. Romae: Typis Zempelianis. MDCCXXXVII. . Colophon reads as: Excudebat Romae Apud Montem Jordanum Joannes Zempel Typographus Anno Aerae Christianae MDCCXXXVII. Mense Octobri.